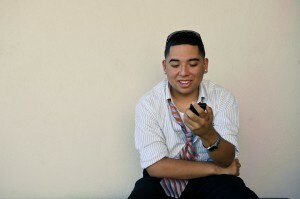 A student at Napa New Tech High uses his mobile phone at school. In my quest to understand how a mobile phone can be considered a learning tool, and whether it can actually help bridge the digital divide between low-income, at-risk kids and those with access to computers, I had an illuminating conversation with Mimi Ito, a cultural anthropologist who studies new media use in young people. Ito is co-author of Hanging Out, Messing Around, and Geeking Out: Kids Living and Learning with New Media, and has been studying the subject of how kids interact with mobile devices. My conclusion: When it comes to the traditional definition of "learning" -- studying a subject like chemistry or literature -- mobile phones are not necessarily the best facilitators. Though kids are remarkably facile with phones -- texting, researching, Facebooking, Tweeting -- it's hard to imagine anyone being able to focus on a complicated subject with any depth of thought using a four-inch device. "Social connections are our primary platform for learning in everyday lives." The potential magic of the smart phone when it comes to learning lies in its ability to provide instant access to facts and the ability to collaborate with others, as well as provide a fun, mobile platform for educational games. Take Project K-Nect, for example. The program is a social-media-based curriculum that combines project and collaborative learning with new media learning for 3,000 high schoolers in three states. An Algebra 1 curriculum has been distilled into mini apps that include instant messaging and blogging, assessment tools for teachers, supplemental activities, project-based learning components, problem sets, and cartoon animation. "Students [take] control of the learning process and create personalized learning communities," said the founder Shawn Gross. But even Gross doubts that for very high-risk students — such as those who are homeless or are attending school primarily for a free lunch — the technology-integrated math class is as beneficial. In those cases, there's much more to contend with than academics, and a mobile-phone curriculum alone won’t change that. I asked Ito to put some of these different pieces of the puzzle into perspective. Q. Do you see any evidence of mobile phones being a legitimate way for low-income kids to learn? Mimi Ito: It’s really too early to tell based on technology adoption trends. It’s more like a glimmer on the horizon. We’re pretty early on the research trajectory. We don’t know empirically exactly what’s happening. What we’re seeing is that things are trending a certain way in terms of tech adoption. The fact that black and Latino youth are leading the way in mobile social media is an interesting trend, because they weren’t the population who have historically led on new technology adoption. What that means for learning and development, I don’t know if there’s any research on that. Q. Based on your research and expertise, do you want to make any predictions? A. I do think the next big trend in the digital technology space is going to be when we see widespread adoption of mobile social media by teenagers. We’re just starting to see the adoption curve, but it's early. With Internet-enabled phones, we’re just at the tip of the iceberg for it to be affordable for kids. So we haven’t seen implications on the behaviorial level yet. "[Mobile] systems are not open enough to allow a lot of innovation and learning from street-level knowledge that young people could be bringing to these systems, and it could bring on even more of a digital divide." Adoption of things like texting, when you see a marginalized group adopt and pick up new technology, you often see interesting shifts and innovations. For example, text messaging in teenage urban girls in Tokyo. They were the first to ride this wave of technology and a way of communicating that’s now really ubiquitous. But the fact that suddenly young teenage girls were the face of technology changed the tenor of what it meant to be a technology user. You still have a very gendered landscape in terms of certain kinds of computer-based technology use. What you saw with text messaging and social network sites in the U.S., suddenly you have a high adoption of new technology that were led by girls rather than boys, and that’s changed the whole public face of what these technologies are and who these technology users are. That’s where if you see technology trends defined not by stereotypical technology users or advanced technology users in this country, which is a white, male, fairly privileged profile, it’s going to be fascinating to see how that plays out. The early trends seem to show that we’re seeing shift in these country. Q. In developing countries, where computers and broadband access have been scarce, mobile phones are said to be substituting or leapfrogging that entire step in technology advancement. A. In countries that didn’t have existing telephone infrastructure much less universal telephone service much less Internet access, mobile phone service has been genuinely transformative in so many ways. Mostly, it's based on the bedrock that it enables social connection between people. Social connections are our primary platform for learning in everyday lives. It's hugely transformative for that context of learning. Because often in developing countries it’s the only portal that they have to the informational universe, people have been much more creative about using those kinds of platforms like texting and information access and retrieval and other kinds of things in the learning phase than what you’d see in countries like Japan or the U.S. or korea, where people have all these other pipelines and other avenues for information. Q. Do you have any reservations about mobile devices as a learning tool? A. One concern with relying heavily or exclusively on mobile platforms is that because of the structure of how mobile services are provided, it’s often more locked down than in the PC-based world. There’s much less overall opportunity for user-level reconfiguration and customization and user level control. Most mobile services have the walled garden approach, and that’s my one concern with certain populations relying exclusively on mobile access and not having access to PC-based uses. So the positive outcome of this phase of innovation is that we’re seeing new entrants doing creative things and developing systems that are driven by needs of populations that haven’t been historically well served by information industries. But the negative scenario is that these systems are not open enough to allow a lot of innovation and learning from street-level knowledge that young people could be bringing to these systems, and it could bring on even more of a digital divide. You have kids who have persistent broadband PC –based Internet access at home, doing much more creative kinds of media production, and sharing and mobilization. And the kids who are reliant exclusively on their hand-held devices let them do a lot of things, but much more on the curated, consumer level experience rather than the activate one. It could go both ways, we don’t really know. Read Part II of my interview with Mimi Ito.